Every type of makeup is here for every type of goth. There’s a plethora of goth styles out there today. As a result, there are many new goth-y colors to pull into your daily makeup routine apart from old-school black. 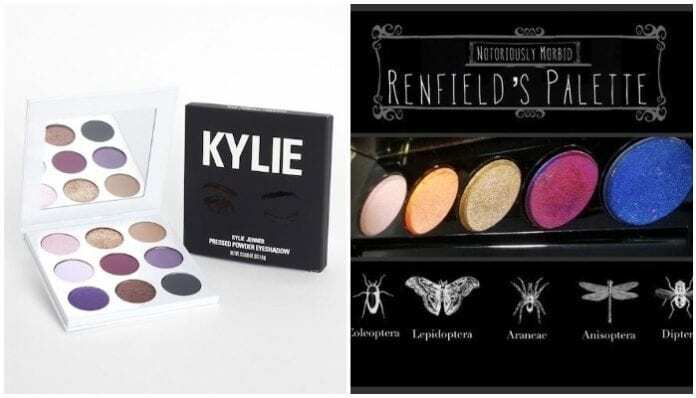 Here are eyeshadow palettes to help you get that perfect Morticia Addams’ cat eye or the darkest smoky eye around. The Cover Shot palettes each contain eight quality shadows that follow particular themes, and obviously the “Punked” palette is our favorite. Featuring dark grays, gloomy purples and a few flashes of silver, “Punked” is a must-have for any glam-goth style. Earth tones and deep neutrals paired alongside one of the blackest mattes you can get your hands on, Kat Von D Beauty’s cult-favorite Shade + Light palette is an essential everyday goth go-to. Lunatick Cosmetic Labs’ palettes all come in signature coffin-shaped packaging that will look eerily perfect on your vanity, and the Vampira and Elvira palettes are their most standout. Featuring images of the iconic TV characters of the same names, the palettes pay tribute to two classic staples of early goth culture. For any goth looking for a little more color in their full beat, look no further than Jeffree Star’s bona fide Blood Sugar Palette: a gorgeous combination of reds and purples that come packaged in a replica of an old-school, oddities-style medical briefcase. For anyone who was devastated when Urban Decay discontinued their Naked Smoky palette, have no fear. Huda Beauty has created the next best thing: the “Smokey” Obsessions palette. This palette is geared to give you the perfect, deep smoky eye for any occasion. The Orb of Light palette looks like someone compressed autumn and put it into a half-moon box—any fall matte shade you could ever want is in this beauty. And if that’s not enough, the packaging is to die for.